Works great and is very responsive but needs to have a way to streamline buying multiple volumes at once. But what I don’t understand is what the membership does? Like does it only give you the weekly shonen jump? The only way to read my manga. Been reading shonen jump for years now and this app has been thru it with me since they started going digital. I recommend this to anybody who loves manga. I love reading Manga and one thing that instantly caught my attention when I started reading MHA was the overall quality of the dialogue. Whenever you go to those free Pirated sites the text just always feels mistranslated or just grammatically incorrect. Here you have the actual copy of the page and it is exactly like the physical copies you’d buy at the store. Everything about this app is fantastic and honestly if you are complaining about the price you probably spend more on fast food tbh. Better than the desktop version! Why do you have to pay for this when you can use other websites and apps that don’t require money to read. This so dumb that you have to pay for it to be read. I also read one of your responses. It’s illegal but it’s more used then this most likely. Besides why would I a digital copy when I can get actual copy. Can make so I can buy a manga and that it can be read digital or actually. I would like support you guys in your fight against illegal things but you also have to remember that this is how the world is. Hello!, I just want to let Viz Media, or whoever is in charge — especially the user face developers and the others who have a hand in making reading the material(s) online super easy and enjoyable — know that I greatly appreciate how simple and inexpensive it is to read the content the company provides on their website and app! Thank you! I’ve been using this app for a few years now, and I’m really impressed with the way it’s been improved over time—it used to take a long time to load after the revamp with the simulpubs for Shonen Jump becoming free, but now it’s much faster. It’s my preferred way to read manga, thanks to the seamless way I can turn my phone or iPad to landscape mode and stitch two pages together. My only suggestion would be to have some mature content available online also on mobile, through the native parental controls filter on the device, like how some shows on streaming apps get filtered off or on through that way. Totally understand if it can’t work that way though, it’s not a dealbreaker by any means because I’m still getting access to FREE, LEGAL manga that officially supports the creators! Fixed most of my problems! When I first reviewed this app it was sluggish, hard to navigate, and it didn’t remember what you were reading. That’s all fixed now! It’s still not perfect, I imagine it’d still be a bit difficult for new subscribers to tell what they get for free and what they’d have to pay for. The subscription is an absolute steal at $2 with this serviceable app, I highly recommend it. 4.5/5 stars. App and Membership are 👍🏾 Some Suggestions Though. Everything is great. Im binge reading Dragon Ball Super. I would Love to create a favorite list, also, if there where a way to actually purchase physical copies I would probably buy every single Dragon Ball issue. Because I would like to collect them all. I love the VIZ app. It’s a great way to stay up to date on new manga. But I wish there was a way to make a “favorites” list so i wouldn’t have to search up what I want to read every time I go into the app. If there was a “frequently viewed” page, that would also work out. I wish it had some sort of collection system for manga you want to read that is available with the subscription service. And a bookmark system so I don’t have to remember what chapter I left off. I was excited for the overhaul of the Shonen Jump app and experience, but this latest major update has way more problems than anything! First of all, it’s laggy as hell. Loading takes forever even on a good connection, and just scrolling through the app is incredibly sluggish. If I do manage to start reading something, even that is slow and unresponsive at times. On top of which, this app has suddenly become a HUGE drain on the battery. I have no problem with continuing to be a paid subscriber to the service, but please fix this app. So I did the free trial supposed to be able to read manga but every manga I want to read it wants me to buy? What’s the point of the membership and paying if I can’t read anything without paying for the individual manga? When I’m reading and scrolling through the pages, the screen won’t swipe to the next page or it will freeze in between the two pages and won’t go back to normal unless I shutdown the app, but even then the app will take me back to the previous page I was on and won’t let me proceed with the story. If you’re going to take all the “main stream manga” off of other platforms (that are free) you should make sure that your platform is just as good if not better, especially if you are GOING TO CHARGE FOR IT!! This is laggy, loading times are insane, the fact that you can batch download or delete is a joke, and I shouldn’t have to close out my app 20 times to get everything to semi work. Capping 100 chapters at a time is pretty lame too. Why can’t I download volumes at a time if I have the space allocated???? Get your stuff together because this is pathetic. Maybe you should have hired the people from Manga Rock to make an app for you. Or you should have made an agreement to let them keep certain manga and have to charge for them. I can’t believe this sorry excuse for an app hasn’t been fixed yet. I only use the app for dragon ball but I love not only the free chapters but also the fact that I can keep up with dragon ball! I will still buy every volume of the books but it’s nice to read it for now! For the price, this is an absurd deal. $2 a month to read tons of manga is awesome,but the app doesn't cooperate most of the time. When it works, it's flawless, but it's constantly lagging out so you'll get stuck on the same page or it won't load your list of downloaded chapters or even the store. I'd still recommend it since restarting the app to fix is pretty quick, and the amount of manga is amazing,but compared to something like Comixology, this app is garbage. I really like having this app, it allows me to look at manga I’d like to read next. However, I wish there was a menu that had options like a calendar and watch and whatnot so that we could see upcoming manga. Similar to how the website has these options. Buggy. Could be a lot smoother. Read title, you get the gist. Figure I should write this review since of the new changes. You can read lots of Manga from Shonen Jump for free now. They’ve fixed the problems with it being slow on older devices and show where you last left off in your chapters. Definitely a great deal if you read a lot of Manga. this app is so unstable !!! if you navigate away from the app, it shorts out and you lose your place in the manga you’re reading and have to restart the whole app ! and why isnt there a function to bookmark or favourite series ? how do you have a manga reading app without it saving your place ? its absolutely ridiculous. also, this app is needlessly difficult to navigate. why are some series available for online reading and other not ? why are they even listed if they are nit able to be read with paid subscription ? all in all, this is a seriously disappointing app. there are nonlicensed bootleg manga reading apps with better functionality than this. get it together. Awesome concept for an app but its too laggy and unresponsive, even when i have great service or wifi. Please fix it makes the app borderline unusable. The app has too many bugs and lags way to much. It takes forever to load the home page let alone a chapter. I was expecting more from a viz app, but was greatly disappointed. Usually when paying for a subscription you expect the app to run as smooth as possible. But that wasn’t the case for this app. I admit 1.99$ a month is a good deal, but there is other services that cost a little more but work alot better. And you aren’t limited to what you can and can’t read. Call me cheap, call me a stickler, but I’m just a kid with a part time. $2 a month for some manga is cool and all, but $6.99 for a volume? I’m already paying monthly. At this point I may as well just catch up on what I need to, then cancel my subscription and take advantage of the 3 free chapter system this thing has. I’ll be missing out on the manga I wanted to read anyways, so I can’t lose much doing this. So glad there is now an easy and legal way to support the industry. The app runs well, but it lacks being able to select favorites or to bookmark or track reading progress. Please allow us to create lists to easily navigate to our favorites and what we are currently reading. It’s pretty user friendly when it comes to actually reading manga, except I’m trying to sign up for the membership and when I click the button “only $1.99 a month” under the membership details section it doesn’t do anything. It worked once, but when my phone died while i was completing the transaction it canceled it and now the button is basically unresponsive. In my opinion it seems kind of stupid to make it so difficult for me to give you money. The app has a nice polished look and I use it to read all my manga, but it takes quite a bit of time to start working when you first open it. Unless you already have a manga open, expect to wait a few minutes before you’re even able to click on anything. App is really nice getting constant up to date manga, but super laggy. Laggy when switching pages and even scrolling on the home screen. Would love to see this fixed. The app is great in terms of content but using it is a nightmare, it constantly lags and I have to close it out to get the next page to load. Sometimes it goes on a hot streak where it functions normally. But it’s not common. Last year I decided to subscribe to Shonen Jump to keep up with a series that wasn’t getting new episodes for a while. I was pleased with how much content I got for $20, and the app worked just fine. I was very excited for the new changes coming to Shonen Jump, since I’d be able to start some new series and save a lot of money instead of buying physical copies. After the update however, the app has turned into a buggy mess, especially on an iPad Air 2. It takes forever to load the home page, and often lags for a couple minutes when you first open it. Available chapters for subscribers load pretty slow, and sometimes require reloading the app. On top of all the bugs, there are still several VERY basic features missing. You should be able to see all of the chapters you’ve already read, even if you haven’t downloaded them. It’s annoying having to guess where you left off, especially in series upwards of 100 chapters. Having a list of manga you’re currently reading would be a great addition as well. The new Shonen Jump subscription is a great idea and an extremely good deal. This service has allowed me to start many new series that I now read regularly. These bugs and issues have put me off from spending more money in the app on manga volumes since it’s more annoying to use the app than buy a physical copy. I hope that the problems mentioned can be fixed soon, as I do love the content offered. I like the amount you get for what you pay, but there is no way to save your place while you are reading. It’s very inconvenient. Pages fail to load. Scrolling through pages is slow and clunky. No way to view favorites. Don’t bother. A lot of good manga and large collection. Please make book marking chapters and manga a thing!!! The app runs extremely well for me and for $2/month it has everything I want to read, which is awesome. However, it doesn't have bookmarks or a similar feature that tells me which chapters I've read and lets me pick up where I left off (even without downloading the chapter for offline access), which is a necessary feature for a manga app. I want to support manga creators and pay for what I read, but without that functionality it's hard to recommend the app. That is the one thing this app needs to become the #1 manga app, but for now I will have to find another one. I hope bookmarks are implemented soon, because when they do I'll come rushing back to this one. Recent changes not clear. Did you change this to make it worse? For several years I have been using VIZ Manga and I liked it very much. Recently, the app is experiencing lots of latency and having an iPad 3 so that does not explain things. However, while i saw in emails that changes were coming to Jump, at this time I cannot see any old jump chapters and the browse feature just is stuck. I would hate to delete it and reinstall since I have so much downloaded content. Also, what is up with only can have 100 chapters downloaded? What is the problem with more than 100 chapters? Seems like an unnecessary restriction. So the "improvements" have diminished my ability to use the app. I simply cannot use the app. darn. This app is great it is up to date with all the manga I keep up with. Ever since their last major update that made that app glitchy and unusable, I’ve been waiting for Viz to fix these issues. Finally, this latest release has done just that. I’m no longer experiencing any lag when reading manga. That being said, the app is still missing the most basic and absolutely necessary function for a manga reader: Some sort of queue that tracks what I’m reading as well as saves my place in each series. I’m reading multiple series with hundreds of chapters. I have to keep track of my place on an external website and it’s a real hassle. Also, for Shonen Jump subscribers, there should be a page that lists all series available for us to read. Or even some sort of icon on the list of all titles available that lets subscribers know that that title is available through their subscription. I’ve been subscribed to JUMP since before it went digital. I really like that it’s switched to more of a subscribed digital library service than a magazine. HOWEVER there are some issues. It’s cool because this is a recent change and it can’t be helped. The app is supper finicky and loads slow. I usually have to spend more time getting a chapter to download or open that it takes to actually read the chapter. It’d be nice if tracked what chapters you’ve read And I really wish I could mark the manga I’m currently reading, then get notifications when they update. Please give us full HD picture quality manga. Your shonen jump scanned manga is not high definition. We need to zoom in to read the text but the picture already a bit blurry. Give us all full HD pictures quality! I will annually subscribe to you if you provide the best quality. Honestly, this thing is so great at what it does, that I just keep buying more manga. Super happy with it. I just wish it was a trend with all manga publishers. ok this is great! I can finally read Tokyo ghoul! THANK YOU! App is awesome so far!!! This is a great app for both a casual of fanatic manga fan. I think the only thing that could possibly make it better for myself would be the ability to download the Japanese language versions in addition to the English translation editions. Thank you. VIZ has the best digital presence for manga. This latest release has some great updates to the overall design. This new app does not load my current issue. Thank heavens for the old app. It works way better. The annual Shonen Jump subscription is a real bargain. Please download this app and support your favourite creators! It's great to be able to read shonen jump on my iPhone and the app works well! I'm pretty great. It's quick and simple to use for someone who just loves manga. 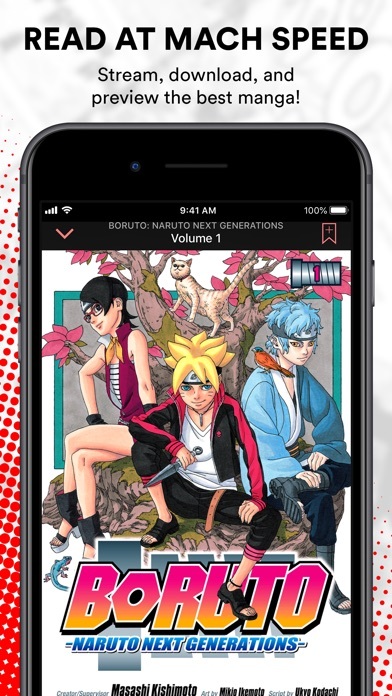 Great app for manga readers. I think this is the best app(I have not tried any others... Yet) out there, I have most of Naruto, Bleach, One Piece, One punch man, Dr. Slump, All you need is kill, and some others. It's worth having, I just got a new iPad and am loving it. It works great with my manga and the picture is amazing(Sorry but its true). This is a app for all you manga readers, I like having the books on paper and do. Like Dragon Ball, Fullmetal Alchemist, Death Note, The legend of Zelda, Tokyo Ghoul, Berserk, and some others as well. But to be able to have all of my books in one place is even better. To be able to read book after book and never have to keep switching from each book is great, but the only problem is if I forget to charge my iPad it does not work. But than again if I don't have proper light the books don't work as well. But with every upside there's bound to be a downside to it as well. Like a knife can have a sharp side but unless its a double edged knife its dull on the other side. I would say get this app, try out some free chapters and see what you think. I don't think you will be disappointed at all. Where has this app been my entire life?! TBH I don’t have much free time of my own (in my adult life) these days, not enough to even watch much TV either. Well, one day I was spending time with wifey and as she dozed off mid-day, the TV was on Adult Swim running a My Hero Academia marathon. As fate would have it, episode 1 started and I found my inner childhood dreams resurface. Reminiscent of when I too used to read and collect comics and early manga of Astroboy, wishing so hard to be able to fly and have an ability that would set me apart from everyone else. I would get lost in those paper pages. But to be able to obtain my literary fuel came at great costs as a child. Not just monetarily but also limitations to physically getting to the one comic store in town. Having then to overcome those two obstacles just to walk in and find, your issue is SOLD OUT!!! NOW ushering into the present day of 2018 and discovering the VIZ APP using my iPod... manga comics are larger than life! Every type of genre available and all at my fingertips. Resolution is crisp, no lag and best of all I’ve not been bombarded by any intrusive, annoying ads. Thank you VIZ! Thank you for making me dream again! Biggest frustration I have is the extremely limited search function when trying to find manga to purchase. No ability to search by manga-ka. Alternative titles (romanization of the Japanese title rather than whatever they decide to title it) not available. No genre search (shōjo, shōnen, josei, etc., or horror, romance, action, fantasy, etc.). Scanlation sites are better laid out, particularly if yoiure trying to find something new to read rather than finding a known title. The new heightened focus on Shōnen Jump chapters makes the home page a total mess. They also collect a heck of a lot of data on users with not much of an opt-out option. Their ecatalog is missing big titles, like Ranma 1/2 and Inu Yasha, as well as a number of more obscure yet very interesting titles I know they sold hard copy that I've wanted to read for a while. Rumiko Takahashi is an incredibly popular manga-ka and has been for decades and Viz is definitely printing English translations of her works, but none of her stuff is on there. So strange. I was expecting a LOT more to be available seeing as Viz has been selling manga here in the States forever and their hard copy catalog has significant depth, but no dice on a lot of titles I was looking forward to buying. Still, it's nice to be able to buy my tankōbon as ebooks, since I've totally run out of shelf space and the towering stacks on the floor are getting unwieldy, and their personal library function works pretty well so far. They do have Bleach, and considering there are eventually going to be 73 tankōbon, ebooks is really the best way to go with that or any of the other long-running titles. They also have a lot of free chapters available so readers can dip their toe and find out if they want to sink the $7-$11 into the manga, as well as entire series in current release, like Boys Over Flowers Season 2 (just don't try to find it under Hana Yori Dango). Its okay, needs an update for a better manga selection. i think its amazing yay!!! I’ve been a subscriber since you guys went simultaneous release and I wanted to leave a quick review. You guys are doing a great job with the app and content. Beautiful layout on IPhone X. Really looking forward to reading jump and One Piece on the go when I don’t have my iPad with me. It is really cool that this app exists, and is only $2 a month, and downloads are very generous. BUT 1) you can’t add a series to your favorites for easy tracking. 2) your progress on pages are saved, but not progress between chapters isn’t if it’s a chapter by chapter manga 3)I’ve frequently had issues with pages from prior chapters loading in to the current chapter. 4) the interface takes a while to load. This app it’s almost perfect, it only need anime to be perfect. 5 stars! The content and layout are great, but the app often freezes or slows way down when scrolling or trying to actually read the manga. Viz, it should not be easier to read internet bootlegs than to navigate the manga chapters in your app. I am all about supporting the industry, but please fix this. I can easily download fanmade translations of then manga I am trying to read with less effort than trying to read through a single chapter in this app. I want to support the artists and enjoy this app. Squish the bugs!! The app was running fine before and then things changed...I thought it’d be for the better but now the app is slower than it was before AND page turning isn’t as smooth as it used to be. I’m seriously considering completely switching to Kindle! I think this app needs some quality of life improvements, namely the ability to either bookmark individual chapters or the option to delete chapters that you finished reading rather than waiting for the “read by” time to elapse. Otherwise, great app. Latest version is sluggish and crashes. Navigating your library has improved but everything else is worse. The prior app was much better in all other aspects. Pricing is harder to view than before. You have to open the info dialog to see the price for a volume or chapter. The app is now painfully sluggish. The lag between input and reaction is very distracting and often makes me think I didn't tap or drag, causing multiple reactions once the app catches up. I've had it crash multiple times since I upgraded to this version a couple days ago. It makes it painful to use. Please fix the performance and reliability. And list prices under the volumes in the main view again. Just the new memberships(1.99$) and every time I open up it crashes after a few minutes. Please look into. It’s really annoying while reading. Pros: Just subscribed because for $1.99 you do get so much manga to read. It’s also a great way to support creators and get quality translations. The pages are also great looking and don’t look pixelated. Cons: The app itself is easy to navigate, but it’s hard to find manga that’s included as part of my subscription within the browse section. I clicked on 4-5 different series before I was able to actually locate one that was a part of the subscription. Please add a symbol or add another filter to just show what’s available in the subscription. Or have an option to hide the paid series. I would also like if you could bookmark a section in a chapter and be able to come back to it later. The loading times on front page take awhile as well as when you are looking at a series. I like this app but I just found out that they are missing whole volumes of many of their older mangas and only the newest ones are available for purchase. I was looking to purchase a whole series but I don’t even see them. Please fix this then I will change my rating. Overall great! It got me back into manga in a big way! It's a great app if you love to read mangas. And it's better than the android version imo since it has a search engine added 😎. Finally, after watching my hero academia season 3, I’ve been waiting read the manga for a long time, but with this app I can finally the manga and other anime mangas. While the old fashioned way of collecting manga volumes was fun, it’s just much more convenient to be able to have it all in on place on my tablet. Speaking of which, it runs well on older hardware, in my case the iPad Mini 2. Really, the main thing that is a selling point for me is the screen size compared to the traditional TPB size. The extra space really helps the art pop in a way that you can’t do on paper. Enjoy the App and what it has to offer. User friendly and good layout of the manga. Please consider linking to retail paperback versions of manga as well. Content is good, but the presentation could use some work. The UI is jumpy/jittery. The downloaded manga section is cluttered with free preview offers. You have to download a whole Jump issue, even if you only want to read a single chapter out of it. It’d be nice if there was some way to see when the next Jump issue would be out, even if the cover art isn’t available. If you’re thinking about subscribing to Jump, there’s no way to see what titles are coming out in it. Pros 1. Reasonably priced 2. downloadable purchases (I really love this as it means I can read when wi-fi isn’t available) 3. Official source 4. App runs great, haven’t had it crash in ages since it’s early days before it was fine tuned. 5. Devs actively read reviews and comments to improve their product Cons 1. While a person’s library can be filter for a given title, there isn’t an option to hide books in the library that are not currently downloaded. 2. Free previews are nice, and while one chapter is good enough to judge the artwork, it’s not enough to determine whether the writing and story will be enjoyable. 3. While I understand that publishers tend to specialized in certain genres and demographics, it would be nice to see a wider variety available. App is extremely buggy and slow. 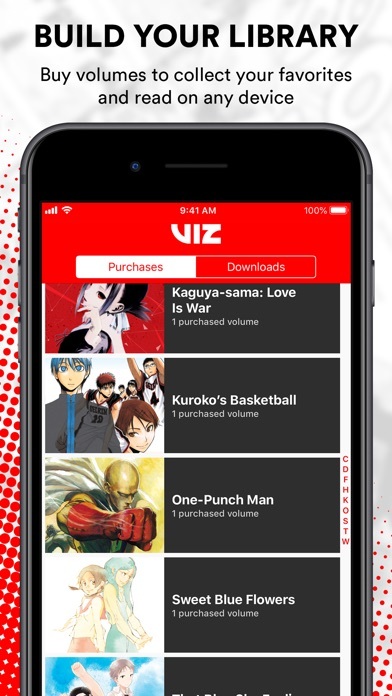 I’ve been a long time manga reader my whole life and when I heard about the new subscription service that Viz was rolling out I was excited to try it and happy that a more affordable method of reading and supporting manga was available and in this regard I highly recommend signing up for this subscription service. However I would also like to point out some issues I’ve experienced while using this app. I downloaded this app to catch up on some of the manga series that I already follow including One Piece, My hero Acadameia and Black Clover as well as taking the opportunity to check out some other series that have caught my eye including Dr. Stone, My hero Acadameia Vigilantes and the new Ne0;Lation. And over all I would say that I had an excellent time reading these series and felt great about supporting the authors and Shonen Jump as a whole. One issue I’ve noticed however is that when I first load up the app to read a series that I don’t have downloaded it will often only show the latest free chapter and none of the others. To fix this I have resorted to going to the settings and going to my membership where the app will then recognize me as a member and all the chapters will show up (this could be a loading issue with the app just starting up). Another nit pick is also that there doesn’t seem to be a way to keep track of what chapters you’ve read in a series so it’s mainly up to the reader to keep track of what chapters they’ve read which can be a nuisance. I’ve also noticed some image loading errors when reading some panels as well. But that’s as far as my problems with the app go in terms of how the app performs as well as what feels like a somewhat outdated UI. I would also like to point out some issues I have with the subscription service in hopes of them hopefully being resolved or at the very least heard. While it’s excellent that you have access to the latest manga chapters legally as well as Viz’s whole manga catalog (which is like a dream come true for me as someone who has read manga my whole entire life!) I unfortunately noticed that this doesn’t mean you have access to every chapter of a whole series and some if not large gaps of certain series are missing which is frustrating to say the least. The series I’ve experienced this with is Dr. Stone, My Hero Acadameia Vigilantes (this ones misssing a good amount of consecutive chapters) and Black Clover. While this is annoying the app also goes out of its way to show that you can buy the whole manga volume which contains the missing chapter which honestly felt insulting considering I’m paying this monthly subscription fee. 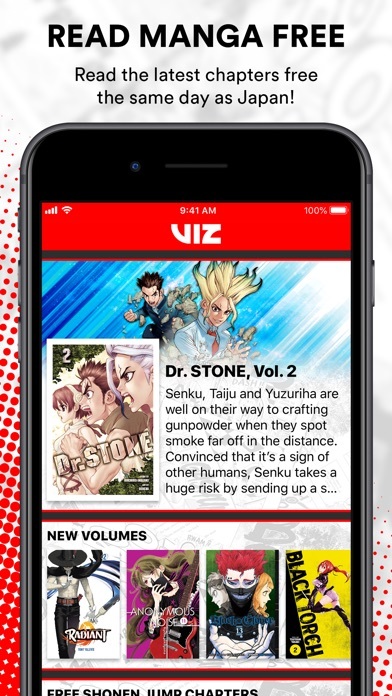 The fact that these volumes are advertised show that Viz has them and that they’re purposely not made available for subscription users to read. On top of that I’ve noticed that these missing chapters are very climatic and crucial points in these series that have been built up for awhile which makes their omissions feel deliberate in order to gain another quick buck. I understand that this service is meant to curve pirating and make access to manga and supporting artists more accessible and cheaper but cutting out these chapters will honestly just make readers reconsider their choice of going the legal route and have them defer back to the pirating sites that they’ve previously been using. I’m hoping that this will be fixed and these chapters will be restored which is my main reason for writing this review. I’ve also noticed that while is a generous limit there is still a limit nonetheless to how many manga chapters you can read a day which seems like another pointless and unnecessary restriction on subscription users. 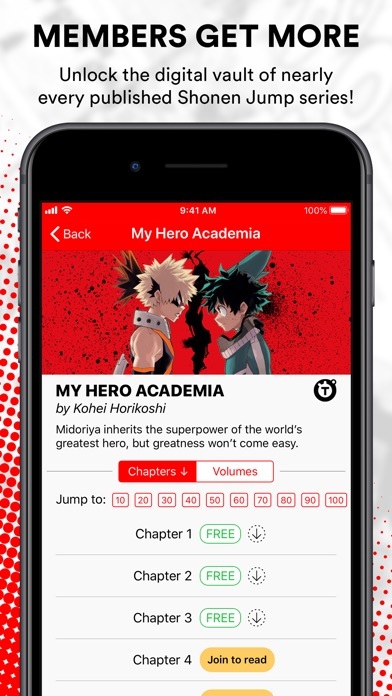 TL;DR Overall as someone who has read manga his whole entire life specifically shonen jump I love this new subscription service and I hope that the problems I’ve mentioned above (missing chapters,reading limit, loading times, UI issues, and membership validation) are addressed so that I can truly give this app the five stars that I know it can reach. And I hope that this review can help anyone on the fence about joining this subscription service. First off: the new subscription service itself gets 5/5, $2 a month for this much content is a steal and I’m happy to support official releases. The app, however, needs a lot of work. Going from Marvel Unlimited to this is quite jarring. The app is sluggish, it crashes if you leave the app or close your phone (at least for me), and nowhere does it keep tabs of what you’re reading. Hope you remember the exact chapter of One Piece you were on! The app also doesn’t do much to show exactly what content you get access to with the subscription and which you must pay for individually, which I see has caused confusion in some reviews. I’m hoping the best for the future, but right now it’s hard to recommend even for $2 a month. I really like this app, however the only problem I have with it is when I turn my phone off in the middle of a chapter or just go to a different app when the app is still open and I go back to Viz the screen turns black and freezes the app making me turn the app off and opening back up again. I love the capabilities of this app. But functionality is pretty awful. It often gets disconnected from the internet. I would love it if there was a bookmark option. Since this is a chapter base viewer. When I close the app, I spend 10 min next time I open the app wondering where I left off. The read and download button are also too close together. I mistakenly always click read when I want to download. This is a way to support the mangaka. Better than buying the original Japanese volumes and paying for middlemen. Better than amateur translations and barely legible text. Unfortunately their free section is small and doesn’t offer the full series but it does the job. I would much rather watch ads and earn coins to buy the chapters than pay for it with my savings, something webtoons has the upper hand in. VIZ. STEP IT UP! I love having dozens of manga downloaded so I can read what I want in the moment. For the high quality comics the prices are reasonable. Only thing I would like is an account option where the read comics are already deleted. I have trouble keeping up where I am in the series since there is no tracking to tell you what book/chapter you read last. I was just wondering what happens to our weekly magazine? I have yet to get one? I like the app it works great. Most of the time, I have noticed from time to time it don’t show some of the manga for sale. I was hoping you guys did not do away with the weekly magazine in favor if those free chapters. I have been a subscriber for years and would like to keep it that way, but if these free chapters are what we are going to get for the weekly jump than I won’t be a member anymore. So far so good except for one minor problem. For the price and selection available, it’s really quite a steal! Now I can read as much manga as I want quite comfortably! However, I’ve been encountering an annoying problem, specifically with the Promised Neverland. Every chapter has one-to-two pages replaced with pages from the previous chapter which means I’m constantly confused with what’s going on. Please fix this! I really love this manga and don’t want to resort to other sites to get the same experience. They expect me to pay $1.99 a month so that I can spend $6.99 on each volume in order to read them. Yeah. No. The new updated version effectively doesn’t work on my phone. Everything runs slowly, new issues of WSJ won’t populate in my library forcing me to read through my laptop’s web browser, and everything is slow to load and unresponsive. I understand it’s a new iteration of the app and it’s also the holiday’s, so I’m willing to wait a little for the bugs to be worked out. But if the app stays in this state I’ll just delete it because it’s effectively unusable, and it’s a strict downgrade of the version I’ve been using for nearly five years. With Viz’s new format, both this and the Shonen Jump app is full of bugs, but they are working on straightening it all out... I hope. Paid for the subscription but cant read more than the first 3 chapters and last three chapters of a manga in the app. Went to the actual website on my phone and could read all the manga... now for some reason Viz and Shonen jump won’t even let me read the manga even though I paid for it on either platform including going to the website. These companies have a bad way of managing subscriptions. The app itself needs work. The app crashes whenever I answer a call or leave the app and it keeps asking me to buy stuff that my membership should cover already if I don’t access the material in a certain sequence. I do love the material though. I think a revamped layout would improve user experience. Being able to find the chapter I left off with and having a list of manga that I’d want to read could streamline the process. Also I experience a bug when my phone auto locks it make the chapter I was reading glitch out. The app itself functioned better before the big update. Previously, loading times were quick, downloads rarely glitched, and the manga chapters loaded smoothly. Currently the app gets stuck trying to load the main page, it takes 15+ seconds to acknowledge downloads starting, and the manga chapters themselves have a tendency to get stuck turning pages (instead of smoothly switching from one page to the next, it will frequently be stuck with half of the first page and half the second, like it gets stuck mid page flip). Crashes are also more frequent than in earlier versions. The service the app provides is great, but the glitches in the recent big update make it frustrating. Only giving this app 2 stars because of how bad it runs, leaving the app to answer a phone call or to reply to a text message and coming back to the app will cause it to crash making no chapters available to read requiring you to close and load the app again anytime you want to leave it. I’m paying the monthly subscription to support the manga artists but I expect at least to have a functioning app that I’m paying for, the app is a great reader for manga and has a lot of chapters to read and releases new weekly chapters with high quality scans and has a very nice and friendly UI, my problem previously mentioned however is killing the app for me. Can we track which chapters are read? Even though I’m logging in it can’t track which chapters I’ve read. It’s annoying going back and forth between app and computer and not knowing which chapter to continue from. This app is pretty straightforward, but with a couple major failures. Every time I leave the app and come back in to what I was reading, the app would freeze or the page would show nothing. I would have to close out the app and find where I left off. On that note, it’s difficult to find where I left off, unless I remember the exact volume. This poses an issue when reading multiple series. The iOS app seems to not have a functional bookmarking feature. I would love if the app can keep track off where I left off. No Shonen Jump on iOS 11? When I got my new iPhone, there’s no download link for the new issue of Jump, only a Subscribe button. I buy my issues week by week and don’t want to subscribe. Didnt wanna purchase something and no refund? Hello i was wondering if i can get a refund i Accidently clicked on a book and it made me pay for it instantly i forgot that i added my debit account is there any way i can please get a refund thank you.